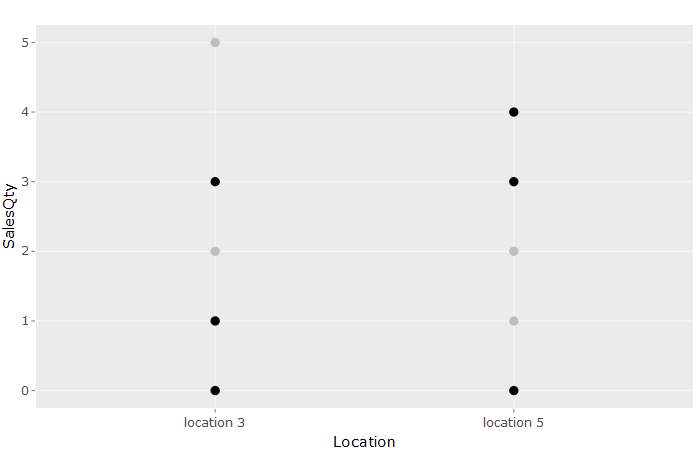 The predictions on each location is just the average per location. This is due to the least squares error per location. I am figuring out how the coefficients of each categorized predictor play a role in the formula for predicting the SalesQty of a product on a location. Only considering the location, the formula will be: ln(SalesQty) = $\beta_0$ + $\beta_5 I_5$ with $\beta_0$ beiing the intercept corresponding to location 3. Now $exp(\beta_0)$ is the average of the SalesQties of location 3 and $exp(\beta_0$ + $\beta_5)$ is the average of the SalesQties of location 5. But when considering 2 categorical predictors, the location ánd the product, I don't see how to interpret the coeficients and the modelling formula. How to test if turtles are dying mostly at a particular time of year? Can a Poisson regression model include only interaction term?